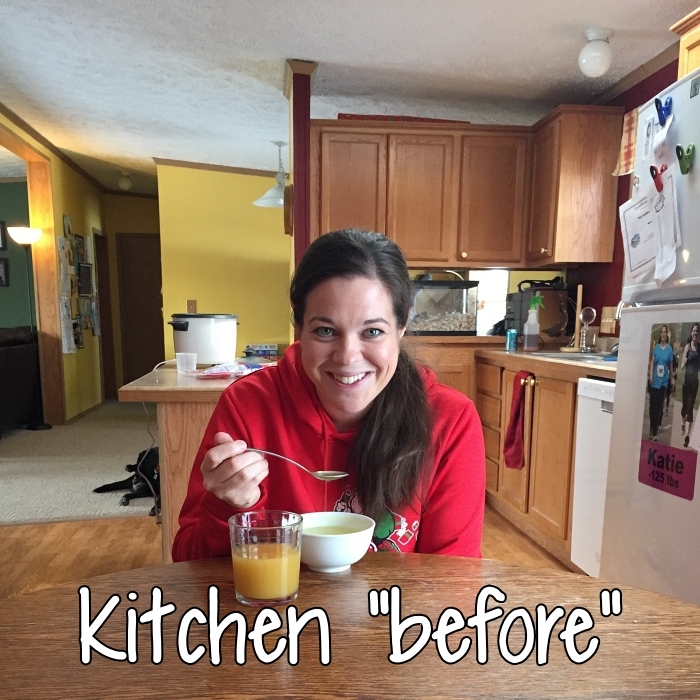 Finally... simple before and after pictures of the whole kitchen/living room/dining room combination. Not very good "before" photos, but you get the idea. And here are the "after" photos. (I used Brian's camera with a wide angle lens, so if they looked slightly warped, that's thanks to my stellar photography skills). Also, no--my house is never this clean! Haha, I just cleaned it this much to take the "after" photos. Needless to say, I am super proud of all the work I put into this. I love the result! I wasn't sure what to do with the countertops. 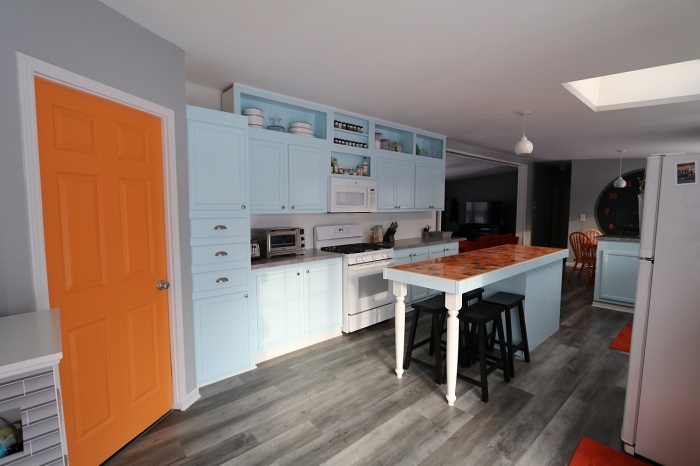 I had planned on painting them--there is actual paint that is used for countertops--but I wasn't in love with the idea. 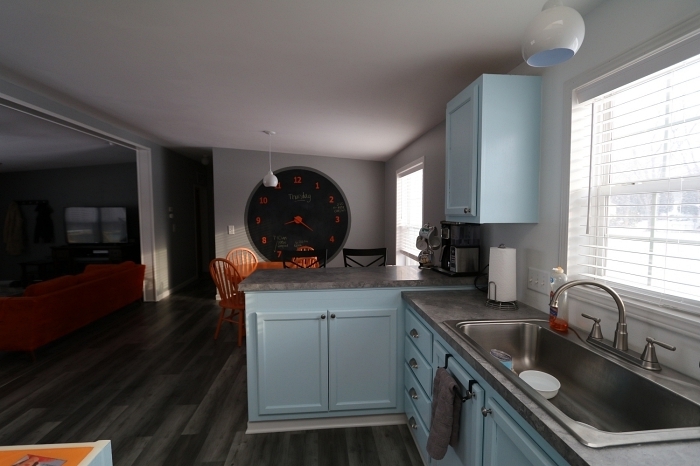 I knew I didn't want to replace them with granite or something (I happen to really like laminate, even though it's not what the cool kids are using these days!). 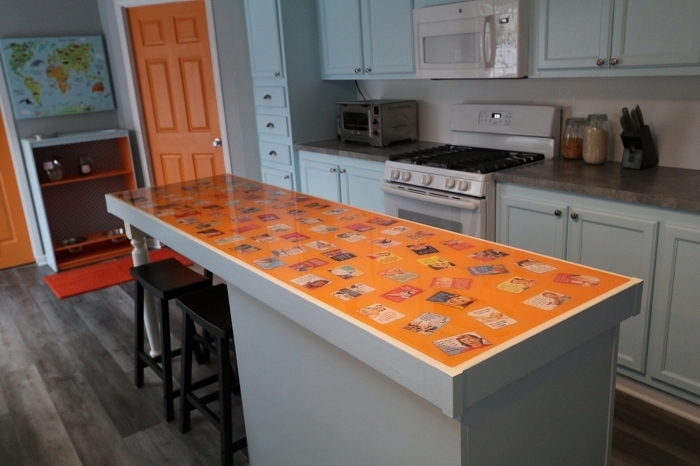 Again, I began some online searches and discovered that people actually make their own laminate countertops. This never even occurred to me! I assumed it would still be very expensive, but after pricing it out, I was so surprised. I wished we'd done it years ago. 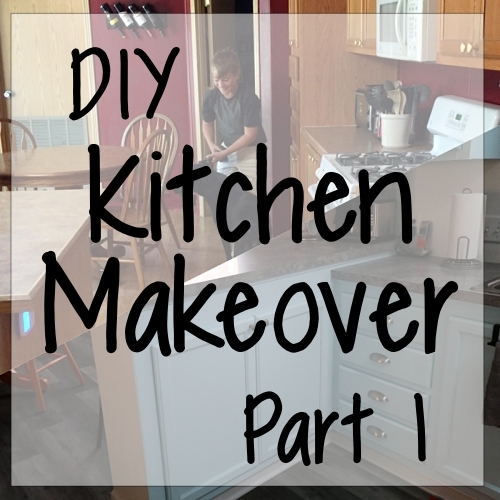 In the end, we made our own countertops out of particle board and sheets of laminate. It was so much easier than I expected! I also installed a new kitchen sink (bigger and only one basin, rather than a divided one). Countertops are much simpler than I thought: particle board, laminate, and contact cement. That's it! 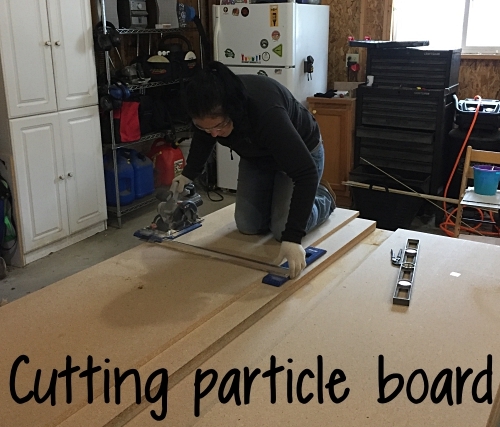 First, I cut down the particle board to the sizes we needed (basically long rectangular shapes). I cut two of each and stacked them so that they would be 1.5 inches thick (the particle board is 3/4-inch). To do that, I put wood glue all over the surface of the bottom one, and then I put the other one on top. I lined them up very carefully and clamped them together to get a good seal while the glue dried. After that, I used a router (I had no idea what a router was--I borrowed Brian's, and I learned that it is the coolest tool ever!). The router basically trims the edges so that they are flush. I was going to try to explain how it works, but it is way too difficult to explain. Just know that it's an amazing tool and I'm sad that I have to return it to Brian. 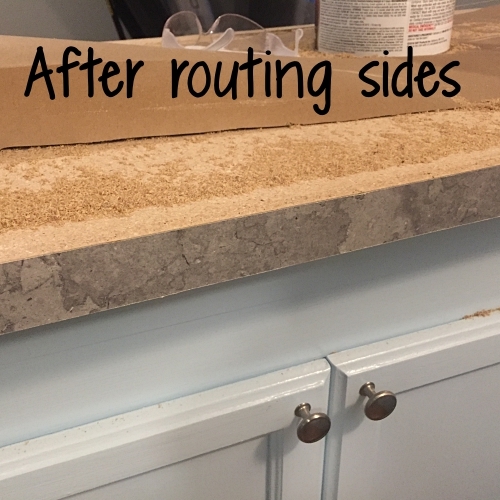 After making sure that the countertops were tightly glued together and the edges were smooth, it was time to apply the laminate. I had to cut the laminate to size (with a bit of an overhang in all directions, which will be cut off later). I put masking tape on top of all of the lines where I'd be cutting (with a circular saw) so it didn't chip the laminate. That worked really well! I cut the pieces for the tops and the sides that would be visible. I let the contact cement dry, per the instructions. Once it was dry, Jerry and I carefully lined up the laminate strips to the sides of the countertop and pressed them together to bond them. I used a router (this time it was a smaller one that is specifically for this purpose--called a trim router) to trim off the excess laminate. The sides were done! Then it was time to apply the laminate to the tops, which is done similarly to the sides. 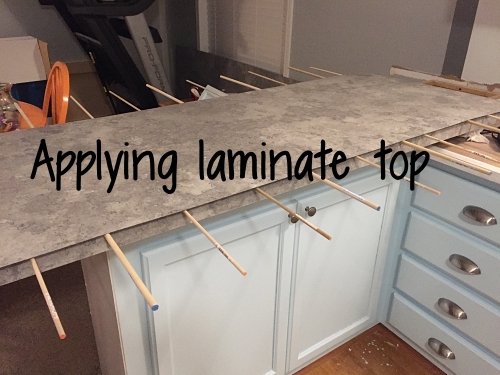 Because the tops are so big, and the laminate sheet has to be lined up carefully, we used dowels to keep the laminate from bonding to the particle board until we were ready. When contact cement is dry, it's not sticky at all. It doesn't bond to other things--only to itself. So by pressing the two pieces coated with contact cement together, they are bonded permanently. 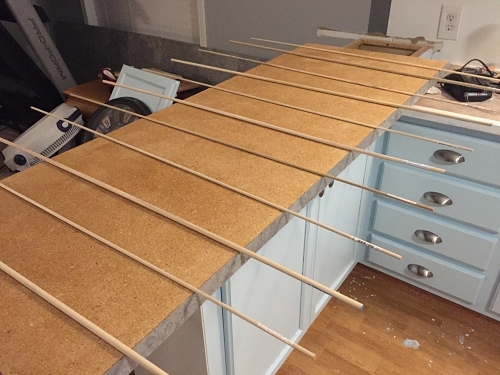 With dowel rods in between the laminate and the particle board, the two can't bond just yet. We laid the laminate sheet on top of the dowels and made sure it was evenly lined up (a small overhang on each side). Then, starting in the center, we removed the dowels one by one, pressing the laminate down onto the particle board. I had been so intimidated to do this, but it was so easy! Once the top was bonded, we used the trim router on each edge to cut away the excess. Viola! New countertops. Jerry screwed them into the counters, and I was thrilled with how they turned out. For the sink, I had cut (with a jigsaw) the hole for the sink into the particle board top, and used a router along the insides of the hole. Then we applied the laminate on top of the entire countertop, even over the hole for the sink. Finally, I drilled a pilot hole in the laminate over the hole for the sink, and I used the router to cut out the laminate to the edge of the hole. I installed the sink (the plumbing was the most frustrating part of the entire project thus far). I was SO excited about how it looked! 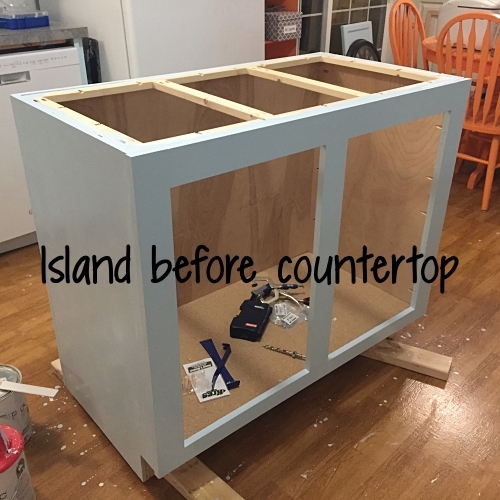 You can read more about the countertops and sink on this post: I Made My Own Countertops! This was a project in and of itself. I had an idea in my head from the very beginning, and I was determined to carry it out. The island we had was four feet long. 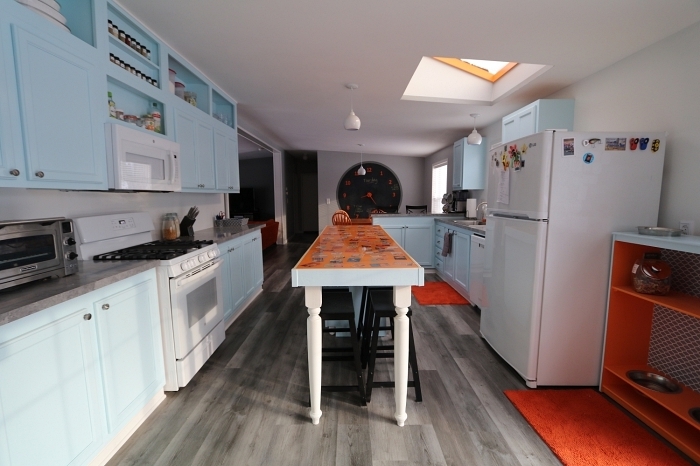 I wanted to extend the countertop to eight feet long, but keep the cabinet part the same size. That way, we could add some barstools and have seating on the other side of the island. I left that post off with a cliffhanger (that might be overdramatizing it, haha!) about what we were going to put down underneath the epoxy countertop. 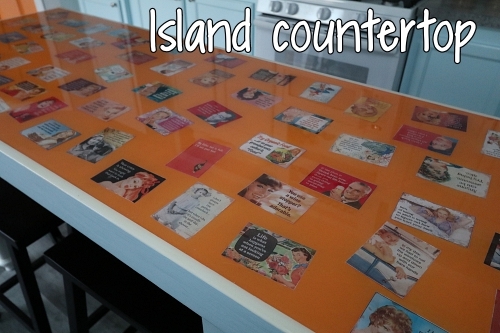 The next post can be found here: Completing the Epoxy Countertop! 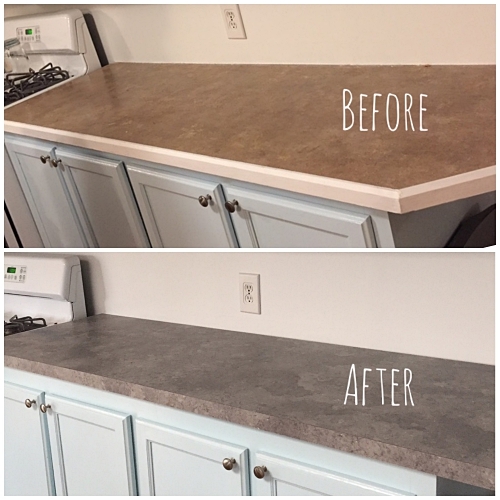 Finishing the countertop was a complete nightmare, and I'm sure I have several (more) gray hairs because of it. This was the most expensive part of the project, and I knew I wanted to do it last, as the "finishing touch". This was all Jerry. 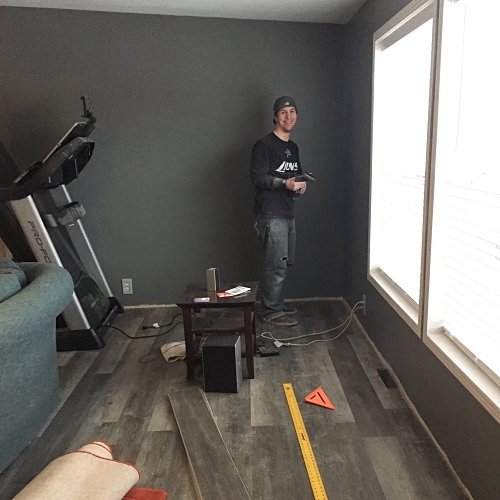 While I did about 90% of the other work (solely by choice--since he works full time, it was only natural that this DIY makeover would be my project), he did an amazing job on the floors. I knew I wanted luxury vinyl planking for the floors. We Jerry installed some in our bathroom, and I really liked it. I searched and searched, reading about all the different kinds, what to look for in terms of durability and quality, and I was completely overwhelmed with choices. I wanted high durability (with two cats, a dog, and two teen boys, it had better be durable!) but I didn't want to spend $6-8 per square foot. In the end, I chose MSI Herritage planks in the color Beaufort Birch (shades of gray--not too light, not too dark). The day it was delivered, I threw on my shoes and coat to go outside and help the delivery guy bring it into the garage. Well, it weighed a tad more than I expected. It was on a pallet, and the pallet full of planks weighed over 2,100 pounds!! Rather than carrying in each 44-lb box, he used a pallet jack. I was SO nervous watching him lower it from the truck to the ground. The ramp on the truck looked very unsteady, and at one point, I was so sure the pallet was going to tip over and fall off the ramp. (The delivery guy said the same thing.) Once it was on the ground, he pulled and I pushed all 2,100 pounds of planks up the driveway and into the garage. 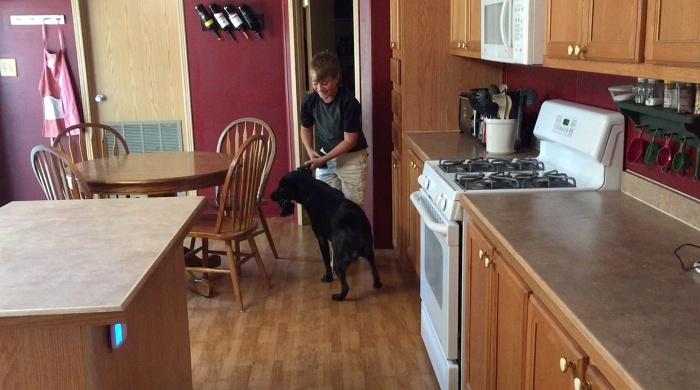 Jerry and I tore up the linoleum in the kitchen, as well as the carpet from the living room/dining room and hallway. And then Jerry got to work. 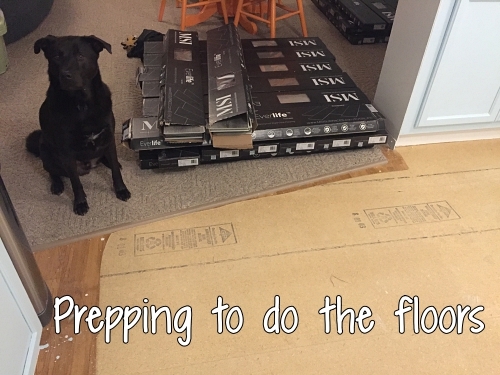 Jerry's friend/coworker used to install flooring for a living, and he was so nice to come over and get Jerry started, giving him tips for installation. 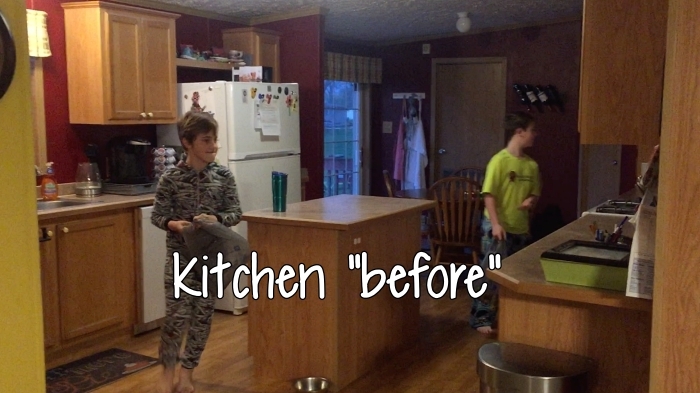 He was only here for about an hour, but he finished nearly half the kitchen! 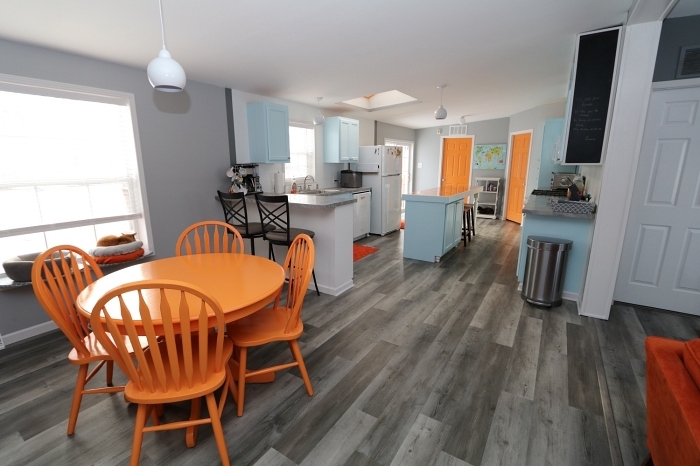 Jerry continued to work on it, and a couple of days later, the flooring was done--in the kitchen, pantry, living room, dining room, and hallway. I was so happy with the floor! Since I ordered it without a sample, I had been a little nervous. But the quality is fantastic and the installation wasn't bad at all (I speak for Jerry on this, haha). We had leftover planks, so we used them in the bathroom and the kids' closets. For the floor trim, I bought this simple baseboard molding from Menards. I borrowed my dad's miter saw and did the baseboards pretty quickly. It was already primed, so I just had to cut and nail it to the wall with a trim nailer (borrowed from Brian). Then I filled in the holes with wood filler, and put a single coat of white paint on it. Done! 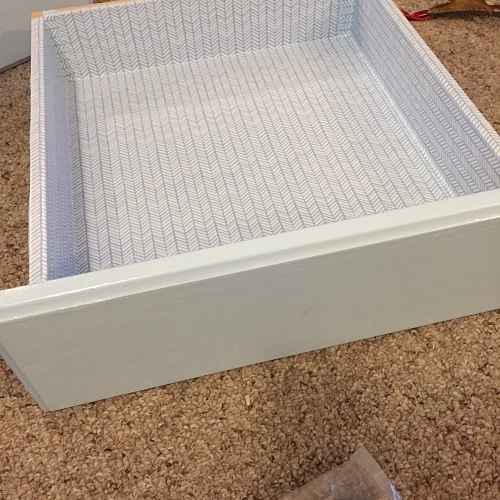 Made a "pet feeding station"
Next up: painting the window and door casings, as well as the window sills and door jambs. Since we were going to replace the flooring later on, I decided to remove the floor board trim instead of painting it (it was very cheap material and definitely not worth trying to save). I would replace it with new trim later. In retrospect, I wish I'd have replaced the molding around the windows and doors. We ended up doing that in the kids' bedrooms, and it wasn't nearly as expensive as I imagined. However, it all worked out, so it's no big deal. 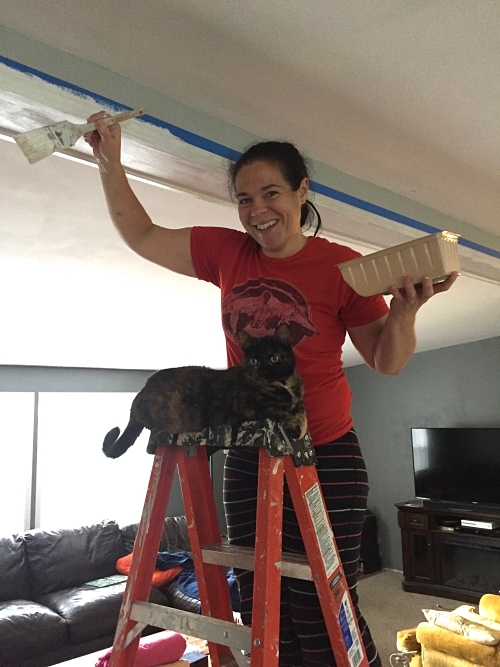 I knew nothing about caulk until I started researching paint, and then I learned all of the great uses of caulk! I filled in any gaps in the molding with caulk (just make sure it's paintable!). I used these little caulking tools to smooth it out, and I was amazed at how much better the caulk made it look. I always wondered how trim looks so seamless and smooth! It's due to caulk and wood filler. I used Kilz oil-based primer on the molding. I thoroughly cleaned it all beforehand, but I didn't sand it. After a lot of research on paint, I decided that sanding trim wasn't necessary. I applied a coat of the primer, and then two coats of oil-based paint. I used Sherwin Williams oil-base in a slightly off white color called "Spare White". 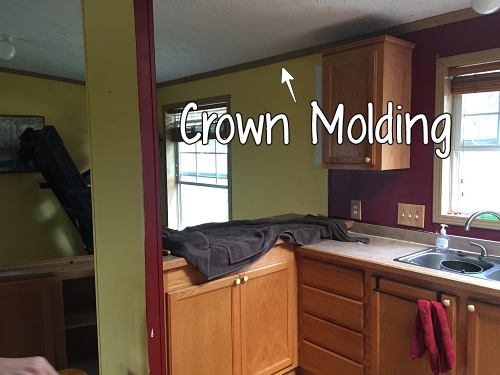 I read a ton about oil-based paint versus latex with enamel, and decided oil was definitely the way to go (on the molding and the cabinets). The main downside of oil-based paint is the drying time (24 hours minimum) and the clean-up (using mineral spirits--no water--and having to properly dispose of the mineral spirits which can't be poured down the drain). It was definitely a pain to use, especially on the cabinets (more on this later) but I wouldn't consider anything else. I also added Penetrol (a paint thinner) to the oil-based paint in order to make it easier to apply and minimize brush strokes. I don't mind brush strokes (I like that they make things look less manufactured) but adding the Penetrol helped with the application a lot. 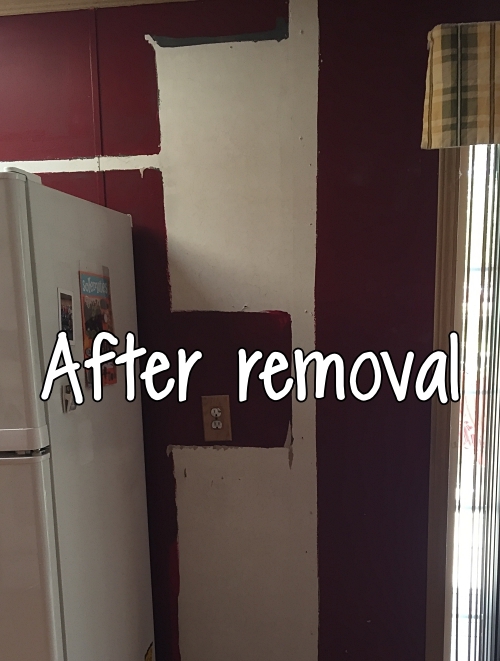 Without it, the paint was hard to spread around and get into the little crevices of the molding and cabinets. Since we were going to have freshly painted walls and new flooring, I figured we might as well give the cabinets a makeover, too. 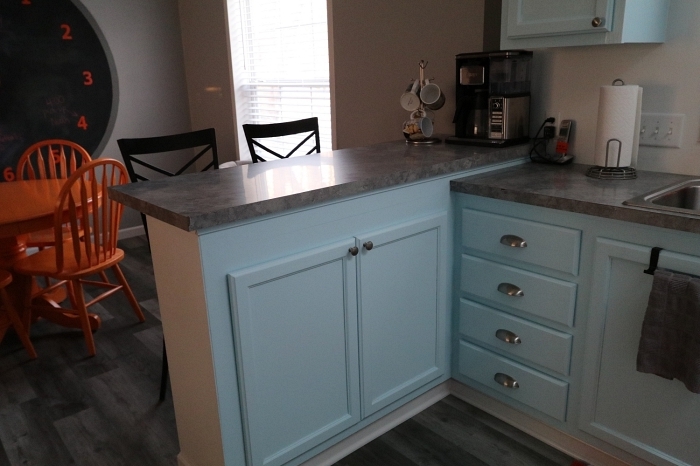 Even though our cabinets are not top quality, they function just fine and I didn't want the expense of replacing them. So, I decided to paint them. 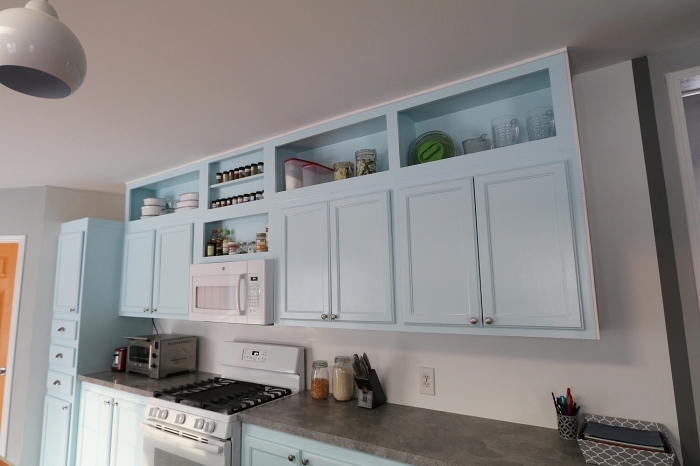 I also wanted to do something with the space between the cabinets and the ceiling. It seems like such a waste of space, so I began browsing the internet for ideas of what to do with it. 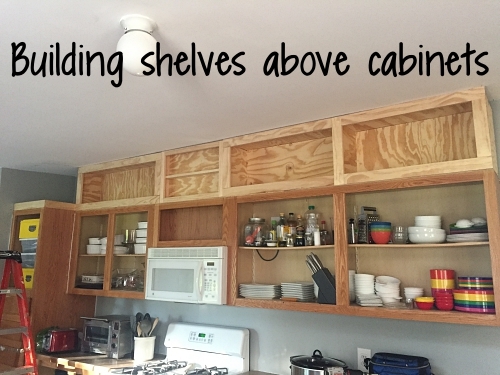 In the end, I decided to make some open shelves that extended the cabinets to the ceiling. I was very unfamiliar with woodwork, and I had no idea how to start. I had some ideas in my mind, but they didn't pan out very well. Finally, I bought some plywood to make boxes and some finished boards to make "faces" (the outer, finished border of the cabinets). I wish I had known about using a Kreg jig for pockethole screws--those would have made this SO much easier! Instead, I used screws, braces, and wood glue. It was much more work than using the jig, but I was happy with how they looked when I was done. I placed them on top of the cabinets and fastened them together. I have a lot of cabinets, even after removing the ones we did in the beginning. 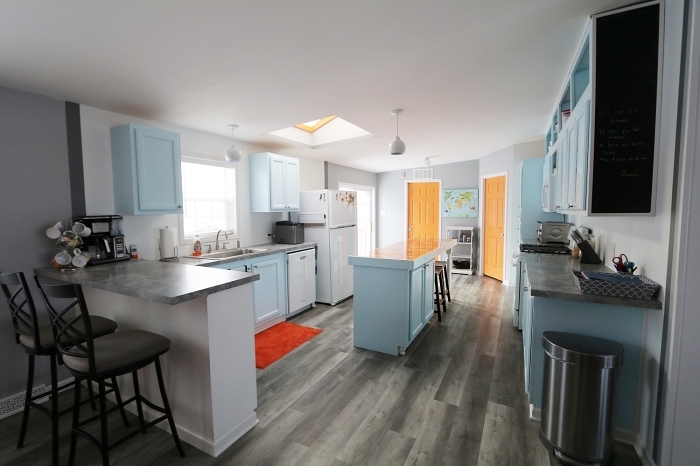 I removed all of the doors and drawers, so I was left with just the "shell" of the cabinets in the kitchen (as seen in the photo above). I knew I wanted to do something different with our island, so I didn't bother painting that just yet. 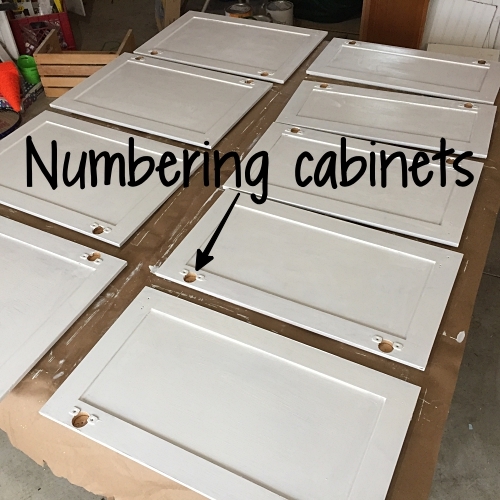 When removing the cabinet doors, I marked a number on each one to correlate with the location of that door to the cabinets. I wanted to put them back on exactly where they were before. I put the numbers inside of the little hole where the cabinet hardware would go, so it wouldn't be seen or painted over. I took all of the cabinet doors out to the garage and laid them out. (Doing this in the house would have guaranteed pet hair embedded in the doors, haha.) I chose to sand these, even though it probably wasn't necessary. I didn't sand them super hard, but I did a light sanding after cleaning them thoroughly with TSP (trisodium phosphate, found in the painting section of Lowe's). I applied a single coat of Kilz oil-based primer. The primer dries really fast, so I was able to apply a coat to one side of the doors on the same day. 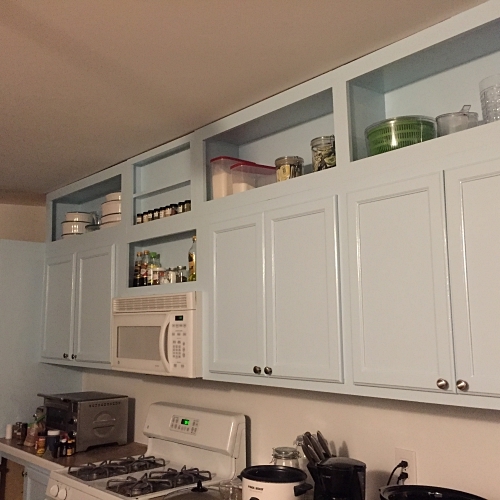 The problem with painting the doors of the cabinets was that I could only paint one side every 24 hours. Also, it got cold outside. I learned that oil-based paint does not like to dry in the cold! It took up to three days for a single coat to dry, and then I'd have to turn it over and paint the other side. The doors took much longer than expected because of this. 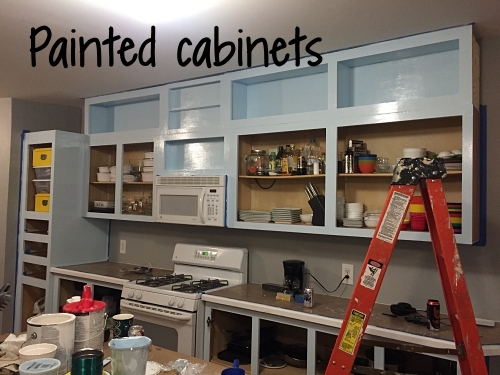 Meanwhile, I got to work painting the "shell" of the cabinets inside. Again, I cleaned them very well with TSP. 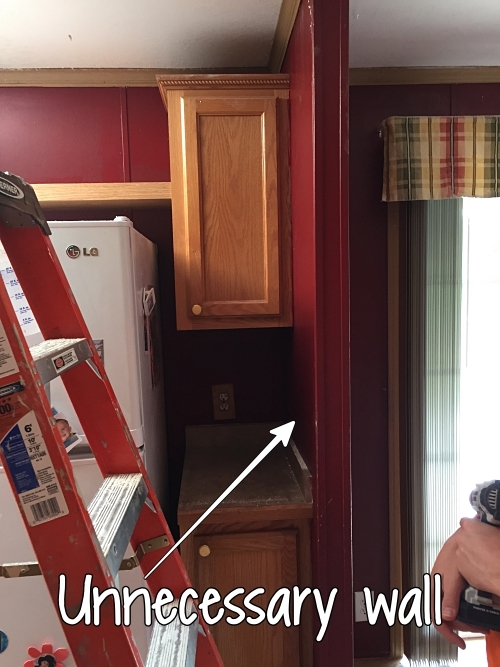 I also filled in the minuscule holes in the cabinets where trim nails were used by the manufacturer with wood filler (it's just a tube that you squeeze, like toothpaste, and rub the filler into each hole with your finger, and then wipe off with a damp rag). Painting the cabinets inside the house didn't take much time at all, because it dried quickly and I didn't have to turn anything over and get the other side, like I did with the doors. While the doors were off, I lined the inside of the cabinets with contact paper, which made them look so much better. Once the doors finally dried, I brought them inside and reinstalled all of the hardware. 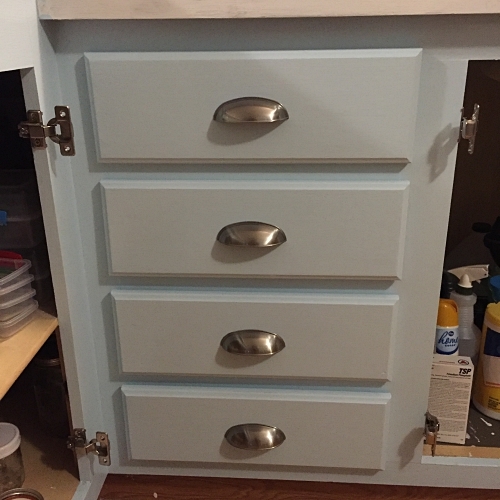 I bought knew knobs and drawer pulls, and used a Kreg jig for cabinet knobs and pulls. This tool was invaluable! I wanted to make sure to get everything on uniformly and evenly, which is much harder than it sounds. 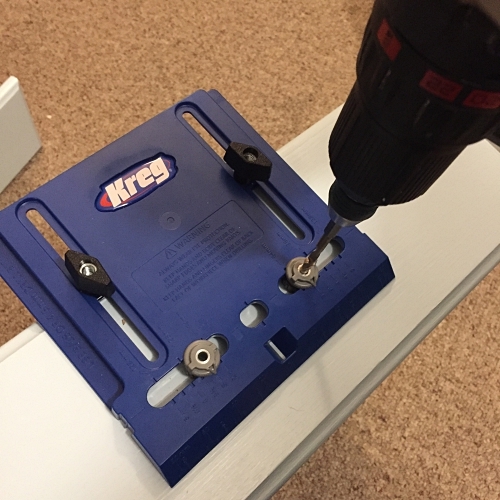 The Kreg jig made it super easy. I highly recommend this if you are installing new knobs or drawer pulls. Finally, I hung all of the doors back on the cabinets, and was thrilled with how good they looked! I loved the color, but I didn't love it next to the gray walls. For some reason, the blue-on-gray didn't look right. I was very undecided what to do. I knew that it would bother me every time I looked at it, so I decided to change it up. I left the gray everywhere except for the areas around the cabinets. 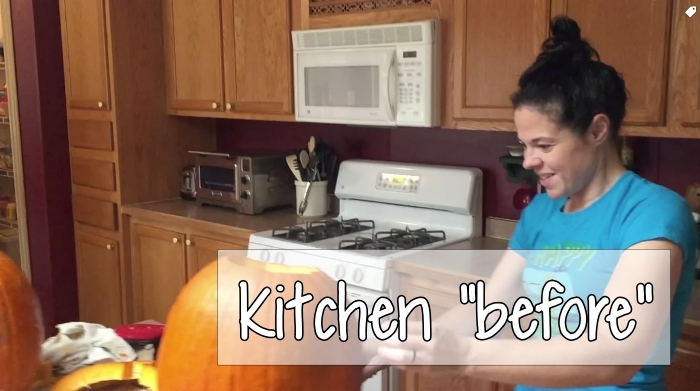 I painted the walls surrounding the cabinets white and it looked so much better! The only problem was the transition from white to gray on the walls. 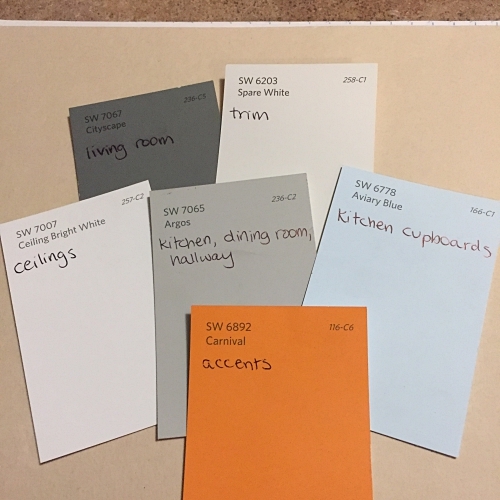 I looked online at different ways to transition paint between rooms, but I didn't like those ideas. 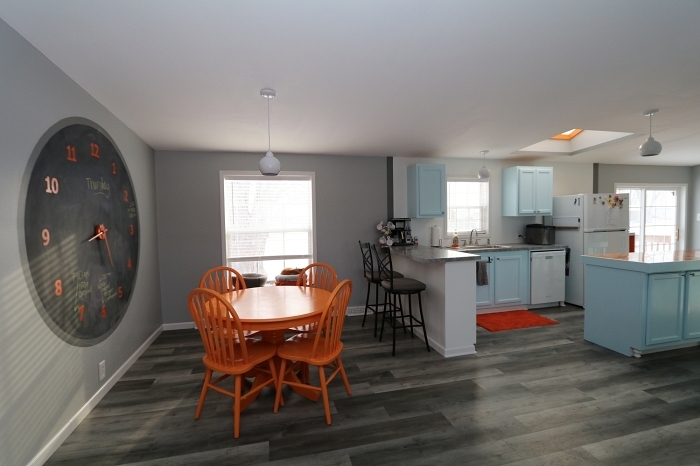 Finally, I decided that a single stripe of dark gray (the color we painted the living room) would work. For this, I did use tape--I used a laser level to get perfect lines and applied the tape along those. Then I painted with the gray between those lines. I really like how it looked after that! I started this as one singe post, but it was WAY too long and has a trillion pictures, so I am dividing it up into four posts. 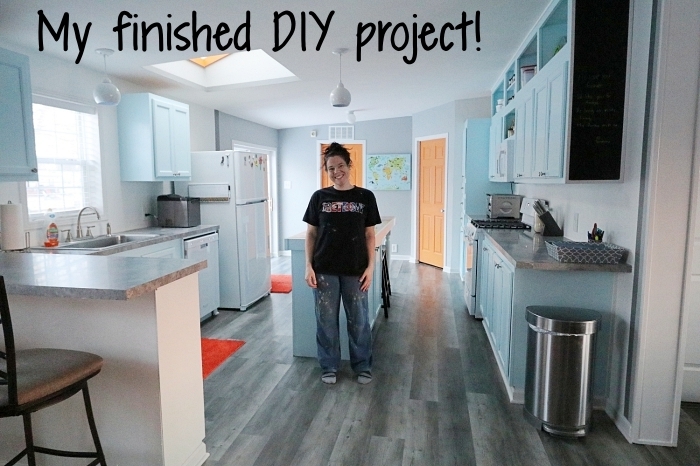 I know a lot of the details will be boring to people who aren't interested in DIY projects, but I worked so hard on this for so long that I wanted to write down everything I did. Mainly as a journal for myself to look back on! 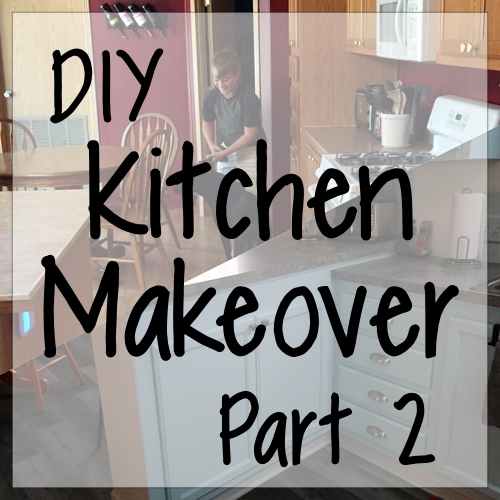 I had so much fun doing this home makeover. Truly. I worked nine-hour days for a long time at the beginning. My favorite part of the day was in the evenings, when Jerry was working nights, and I would listen to podcasts while painting or whatever I was working on at the time. Now that it's over, I kind of miss it! Anyway, I wasn't sure how to organize these posts. I think I'll just do it in chronological order. I'll start with the beginning--write about the projects I did with progress photos, and then I'll do the "big reveal" in the fourth post. So, if you're not interested in the details, just skip to post four. When I started this project, I had no idea it would turn into an entire makeover. After paying off our debt last year, we have some extra money to play with, and I've been wanting to do home improvements for years. I thought it would be fun to pick a project here and there and work on them over time. I made a list of the things we planned to do in the future (as far as home improvement). Do you remember that book called, "If You Give a Mouse a Cookie"? This makeover was kind of like that. There was a section of floor in the kitchen next to the pantry that had some water damage, and I knew it needed replacing. 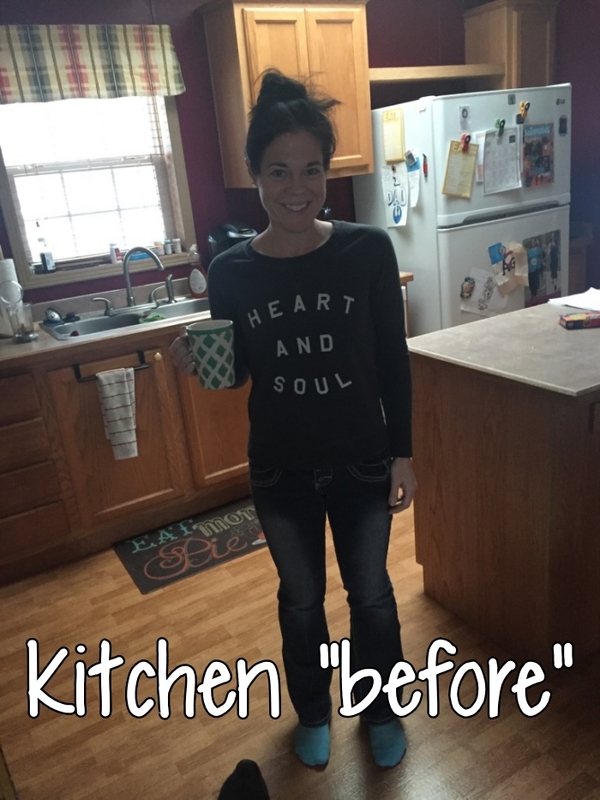 I figured that since we were going to replace that, we might as well replace the floor in the whole kitchen. And if we were going to do the floor, we might as well paint the walls. Since we were doing the walls, we might as well do the ceiling. And so on. 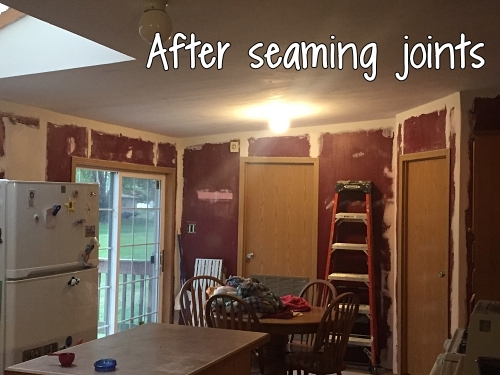 As I was looking around the kitchen, I was struck with the idea to remove a ridiculous wall between the kitchen and and living room. I say it was ridiculous because it was very small (maybe two feet wide?) and was simply there to hold up the cupboards over the snack bar. We removed that wall (and the cupboards) and it already looked so much more spacious. After that, I noticed another wall that was unnecessary, so we took that down, too. Here is my post about when we removed the walls. The beginning of the next seven months' work! I've always hated our ceiling. It had a texture called "Stomped" (similar to a popcorn ceiling, just a different design). 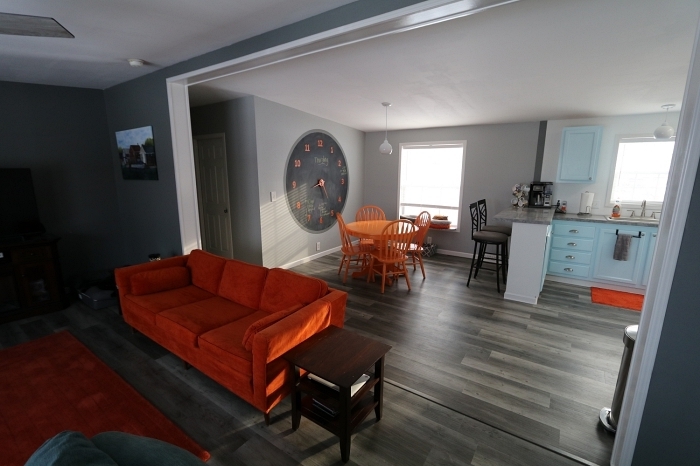 Since it would cost next to nothing and make an enormous change in the look of the house, I decided to look into removing it. 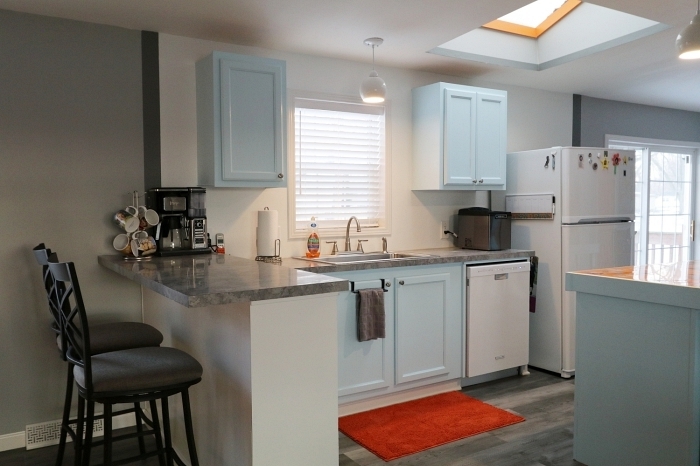 I felt confident after watching a couple of YouTube videos and testing a small spot in my laundry room that we could remove the textured ceiling. It just required a spray bottle of water and a drywall knife, but it made the biggest mess I'd ever seen. 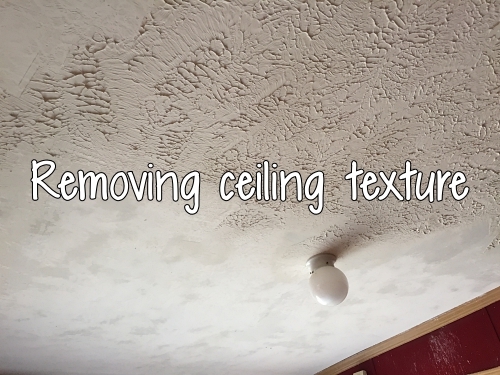 Here is my first post about it: Removing Our Textured Ceiling. I thought this would be the easy part. 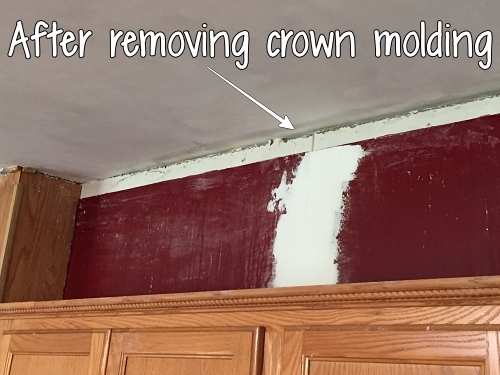 I had no intentions of removing the crown molding--I planned to just paint it, like I had in my bathroom and bedroom. As I was doing the ceiling, however, I was thinking about how much I was going to hate the tedious painting of the molding. The molding was cheap and coming loose in spots, so it was going to need some work regardless. I decided that I would remove it, see what I could do with it, and--worst case scenario--I would have to replace it. It wouldn't be a huge deal. 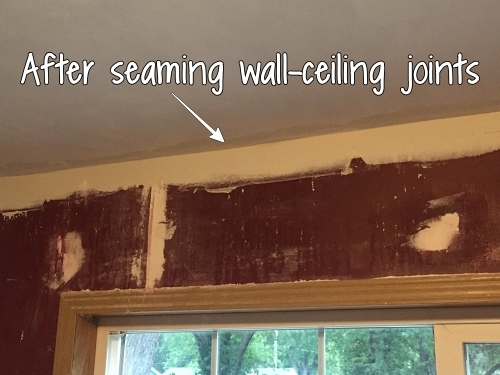 After removing the crown molding, I was kind of horrified to see the gap between the wall and the ceiling. In some places, it was an inch to an inch and a half! 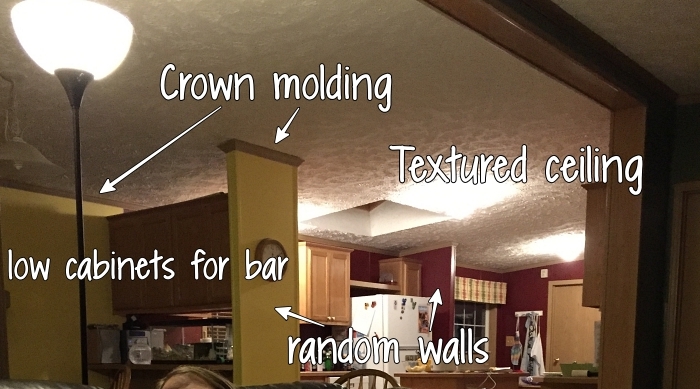 I really didn't want to put up more crown molding, so I started researching what I would need to do to close that gap. By "research", I mean I called my brother, Brian, who knows all this stuff, haha. He explained it, and then I checked out YouTube (an invaluable resource for this whole entire project!). Brian showed me what I would need to buy (drywall compound and tape--the "tape" is really just a roll of thick paper with a crease along the length. It doesn't have adhesive on it. I borrowed Brian's drywall knives and mud pan (along with half of his garage full of tools, which I'll write about later). 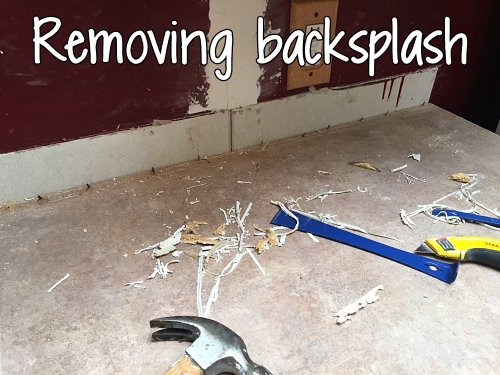 Since I was going to be using the drywall compound on the wall-to-ceiling seams, I decided that I would also remove the strips in the kitchen that cover the wall seams. I'm not sure what they are called, but in manufactured homes (a.k.a. trailers) the bathrooms and kitchen have long strips that cover the seams between each sheet of drywall. 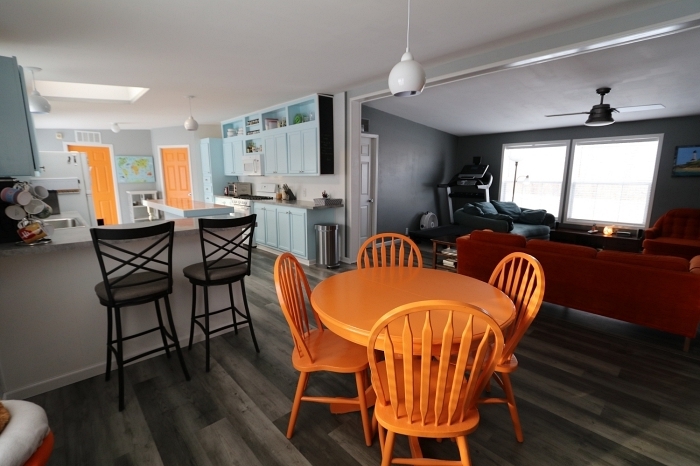 (Most manufactured homes have them throughout the entire home, but when I chose ours, I paid extra for them to mud the seams. They said they could do it everywhere but in the kitchen and bathroom, not sure why.) Thankfully, there isn't a big gap between those seams, and they are an easy fix. 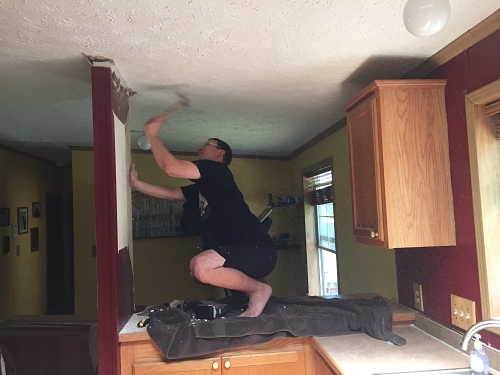 While I was doing that, I removed the laminate backsplash from the wall. I knew we'd want to do a different backsplash, so removing it in order to paint the walls was necessary. It was the wall-to-ceiling transition seams that I was worried about. I felt confident after watching the videos, so I just dove right in and hoped for the best. Surprisingly, it wasn't as difficult as I thought it would be! I just put some drywall compound along the wall and the ceiling (where they are supposed to meet) and then pressed the tape against it, making sure the seam was nice and straight. Then I added more compound on top of the tape. Finally, I took a drywall knife and ran it from one side to the other, pressing the edge against the wall (or ceiling) to smooth out the compound (and remove excess). We were left with drywall compound all along the edges of the ceiling in all three rooms (plus the hallway) and covering the seams in the kitchen walls. 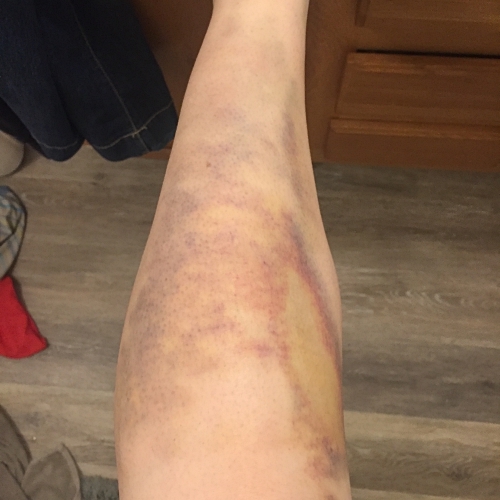 Against the dark paint, it looked pretty bad! I couldn't wait to paint it! I knew it would look much better after a coat of paint. I spent a good amount of time sanding all of the seams so the drywall was nice and smooth. 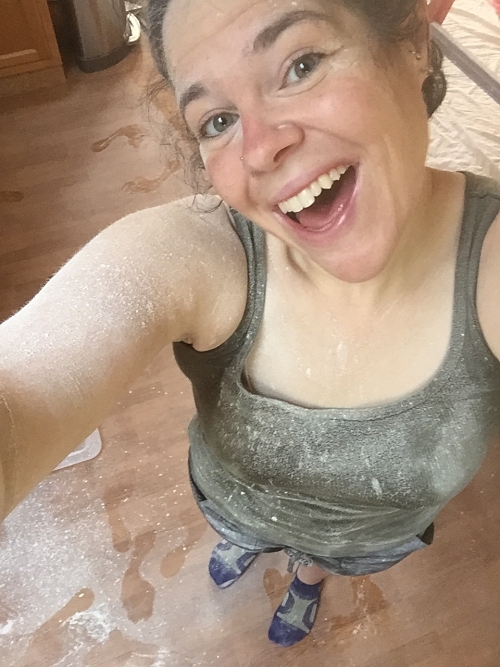 I can't even tell you how much drywall dust there was in my house! 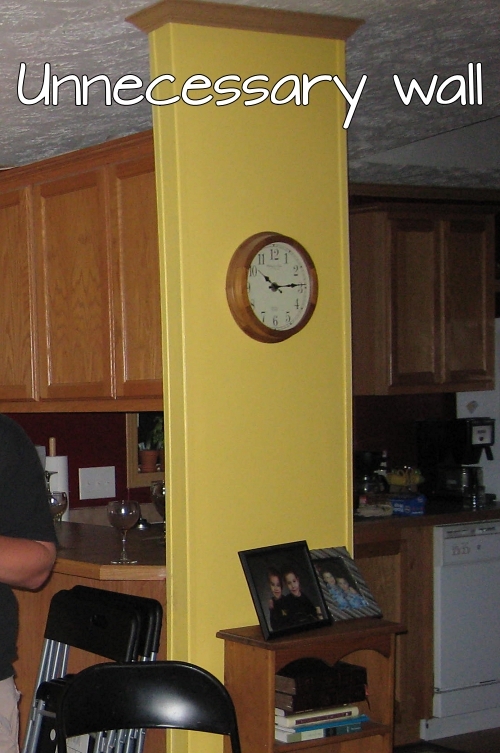 When I would shower at the end of each day, I couldn't believe the drywall dust in my hair. I discovered that it would make the perfect dry shampoo, however--it absorbs any sort of moisture you can imagine. My skin was SO dry. I chose a color scheme that was totally unlike me, especially the blue, but I decided to be brave and go for it. 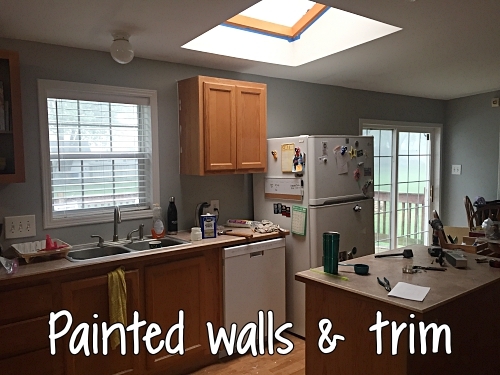 After we cleared out all the dust and thoroughly cleaned the walls, I decided it was time to paint the walls, even knowing I would probably have to touch them up at some point after painting the cabinets and trim. I sanded the walls so they were smooth and wiped them clean of dust. Then I added a coat of Kilz Latex primer. Finally, I added two coats of Sherwin Williams "Cashmere" latex paint in the color "Argos" (a light gray).